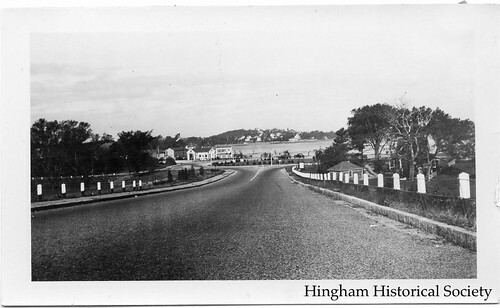 For nearly the last 100 years, residents of Hingham have had to deal with traffic congestion in its downtown, the harbor area, and along Main Street. The recent effort by the town to survey residents about possible improvements to Route 3A and Summer Street is only the latest attempt to try to solve the town’s traffic problems. Documents from the John Richardson Collection and other materials in our archives confirm that the search for a solution to traffic problems has a long history. Starting in the 1920’s the town asked the state to fund a project to take beach and through traffic away from Hingham Square. The state took the easiest solution and expanded Broad Cove Road and Otis Street to four lanes so that 3A could be re-routed away from the eastern end of Lincoln Street and North Street in 1932. Though successful, this action reduced the ability for non-automobile traffic to easily access the waterfront from that date forward. Around the same time, to further speed Nantasket and other traffic east of the Harbor, the state also built Chief Justice Cushing Highway, with the now infamous Harbor Rotary, and constructed George Washington Blvd. to Hull. With the 1950s came the start of the freeway era in the country and Massachusetts. By 1959, the state had completed the 128 Beltway, the Central Artery, and the Southeast Expressway as far as Derby Street (later to be Route 3). Hingham officials saw the new expressway as an opportunity to attract tax-producing industrial and commercial development to South Hingham but also worried about what a potential residential population boom would do to the town. With these thoughts in mind, the Hingham Planning Board produced a report called the ‘1959 Town Plan Summary’ which projected Hingham’s population as 25,000 by 1980 and made a series of recommendations to best accommodate this growth while preserving the town’s character. The report made two recommendations to help increase recreational use of the Harbor. The first was to fill parts of it to connect the Harbor islands to the mainland and build a marina where the Yacht Club is now, as seen in the map below. Second to ease waterfront access to town citizens, and to help solve many of the town’s traffic problems, the Board recommended building a pair of parkways (which, depending on costs, would be built as limited access expressways right away, or upgraded to them in the future) to take Nantasket and other through traffic away from the Harbor area and from Main Street (see Location A in the map below). The north-south parkway would take through traffic from Route 3A at the Back River Bridge southward parallel to Beal Street (by the Ammunition Depot, slated to close and holding out the opportunity for industrial development) and then further south along the western side of town to Route 3. The east-west parkway would then take southbound and Nantasket traffic east, following a route through the center of Town, north of High and Free Streets, and then across 3A to George Washington Blvd. Neither of these plans got off the drawing board: they appear to have largely been an alternative to the state’s known plans for the Hingham area, which included, as can be seen referenced on the top left side map, the Shawmut Trail. The Shawmut Trail was a proposed expressway that would have run from Route 3 near today’s Braintree Split eastward across the Fore River (over a new bridge) to Route 3A in Weymouth just west of the Back River Bridge. It would then have continued into Hingham mostly along the path of Route 3A to end at the proposed Route 128 (later 228) Expressway near Turkey Hill (shown on Map C). As can be seen on the Location B and C Maps above, a portion of the Shawmut Trail route would have run directly from the Broad Cove Rd/Otis Street intersection to the Rotary. This would, as the report notes, involve running Route 3A “on a dike across the southern shallows of the Harbor cutting off the ponded areas from further recreational or boating use.” In other words, this plan would have prevented most of the current activities in the southern end of the harbor. Needless to say, this plan did not impress Hingham’s citizens or town officials. By the end of 1968 the state relented and ended the proposed Shawmut Trail in Weymouth. In the early 1970s the state officially abandoned the plan. Though none of these proposal came to be, a plan to build a relocated 228 expressway came much closer to fruition. More about that in Part 2. This entry was posted in Uncategorized and tagged Archives, automobiles, Highways, Hingham, John Richardson, Local government, Route 228, Route 3A, Shawmut Trail, transportation.